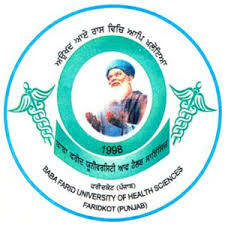 •Established in the memory of great Sufi Saint Baba Farid by Punjab govt. in July, 1998 by an Act of the State Legislature. Fifth of its kind in India, First in Northern India- Punjab Govt. deserves the credit of establishing it.Due to inadequacy of health professionals(in quantity & quality) the need was imminent. Such a University is expected to be a “Pace-setter” – in developing appropriate modes & models of Health Care. University committed to providing Community oriented need based education & Training programmes for Health professionals.